Commercial airlines around the world now carry nearly 2.5 billion passengers a year, and despite the inherent dangers of rocketing through the sky miles above the Earth in a very heavy piece of metal, these travelers are amazingly safe. In fact, the odds of dying on a commercial airline flight are as low as 9 million to 1! That said, a lot can go wrong at 33,000 feet above the ground, and if you’re unlucky enough to be aboard when something does, the decisions you make could mean the difference between life and death. Keep in mind that about 95% of airplane crashes have survivors, so even if the worst does happen, your odds aren’t as bad as you might think. 1.1 HOW TO EVACUATE 873 PEOPLE IN 77 SEC. ?! 2.2 REALITY: It's Safer In the Back. Wear long pants, a long-sleeve t-shirt, and sturdy, comfortable, lace-up shoes. Of course you may want to be comfortable or professional-looking on a flight, but sandals or high heels make it hard to move quickly within the wreckage. Loose or elaborate clothing also poses a risk, as it can get snagged on obstacles in the close confines of a plane. If you know you’re going to be flying over cold areas, dress appropriately, and consider keeping a jacket on your lap. You’ll need to be able to stay warm if you survive the crash. Even if that is not a consideration, the more of your body is covered during impact, the less likely you are to receive serious injuries or burns. Cotton or wool clothing is also preferable as it is less flammable. Wool is preferable to cotton when flying over water, as wool does not loose its insulative properties to the degree cotton does when wet. Book the right seats. Because the initial impact is most often survivable, the key to living to tell about a crash is frequently how quickly you can get out. To this end, it’s best to get seats as close as possible to an exit, and aisle seats are generally preferable. In addition, try to sit in the back of the plane. Passengers in the tail of the aircraft have 40% higher survival rates than those in the first few rows. Read the safety information card and pay attention to the preflight safety speech. Yes, you’ve heard it all before, and you’ll probably never need it, but if you keep your headphones on during the preflight instructions or ignore the safety card, you’ll be missing out on information that could be vital in the event of a crash. Don’t assume you know it all already, either. Every type of airplane has different safety instructions. If you're sitting in an exit row, study the door and make sure you know how to open it if you need to. In normal circumstances the flight attendant will open the door, but if they are dead or injured, you'll need to do it. Make a plan. If the plane is going to crash, you almost always have several minutes to prepare before impact. Use this time to once again review where the exits are, and try to count the number of seats between your row and the exit row—that way you’ll know when you’ve reached the exit even if you can’t see it. Assess the situation as well as possible. Try to determine what surface the plane will land on so you can customize your preparations. If you’re going to be landing in water, for example, you’ll want to put your life vest on—don’t inflate it until you’re out of the plane—and if you’re going to be landing in cold weather, you should try to get a blanket or jacket to keep you warm once outside. Keep your seatbelt securely fastened at all times. If the plane crashes while you’re sleeping, you’ll be glad you kept your seatbelt on. In any case, make sure it is placed around you snugly before impact. Every centimetre of slack in your seatbelt triples the G-Force you'll experience in the crash, so keep it snug! Brace yourself for impact. If you know you’re going to crash, brace yourself. Return your seat back to its full upright position and assume one of two "brace positions." If the seat or bulkhead in front of you is close enough to easily reach, place one hand palm-down on the back of that seat, cross the other hand palm-down over the first hand, and rest your forehead against your hands (don’t lace your fingers). It is also sometimes recommended to put your head directly against the seat in front of you and lace your fingers behind your head, tucking your upper arms against the sides of your head. If you don’t have a seat close in front of you, bend forward and put your chest on your thighs and your head between your knees. Cross your wrists in front of your lower calves, and grab your ankles. In either position, your feet should be flat on the floor and further back than your knees to reduce injuries to your feet and legs, which you will need in order to successfully exit the craft after impact. Remain calm. It can be easy to get swept up in the pandemonium immediately preceding and following a crash. Keep a cool head, though, and you’re more likely to get out alive. Remember that even in the worst wrecks, you do have a chance of survival. You’ll need to be able to think methodically and rationally to maximize that chance. Put your oxygen mask on before assisting others. You’ve probably heard this on every commercial flight you’ve been on, but it’s worth repeating. If the integrity of the cabin is compromised, you have only about 15 seconds (often less if you’re a smoker or have circulatory or respiratory problems) to start breathing through your oxygen mask before you are rendered unconscious. While you may feel an impulse to first help your children or the elderly passenger sitting next to you, you’ll be no good to anyone if you don’t remain conscious. Protect yourself from smoke. Fire and, more commonly, smoke is responsible for a large percentage of crash fatalities. The smoke in an airplane fire can be very thick and highly toxic, so cover your nose and mouth with a cloth to avoid breathing it in. If possible, moisten the cloth to provide extra protection. Get out of the airplane as quickly as possible. It’s critical to get out of the aircraft without delay—if fire or smoke is present, you will generally have less than two minutes to safely exit the plane. Obey the flight attendants’ post-crash instructions. Flight attendants undergo rigorous training to make sure they know what to do in the event of a crash. If a flight attendant is able to instruct or assist you—sometimes they won’t be able to do so after a crash—listen to him or her, and cooperate to increase everyone’s chances of survival. Don’t try to rescue your belongings. It’s common sense, but still some people don’t seem to get it. Leave everything behind. It will only slow you down. Make sure the exit you choose is safe. Look through the window to determine if there is fire or some other hazard outside of an exit. If there is, try the exit across the plane, or proceed to another set of exits. Get at least 500 feet upwind from the aircraft. If you’re stranded in a remote area, the best thing to do usually is to stay close to the aircraft to await rescuers. You don’t want to be too close, though. Fire or explosion can result at any time after a crash, so put some distance between you and the plane. If the crash is in open-water, swim as far away from the plane wreckage as possible. These instructions cover small passenger planes and jets (not commercial airliners). 1. If the plane has only one set of controls, push, pull, carry, or drag the pilot out of the pilot’s seat. 2. Take your place at the controls. 3. Put on the radio headset (if there is one). Use the radio to call for help—there will be a control button on the yoke (the plane’s steering wheel) or a CB-like microphone on the instrument panel. Depress the button to talk, release it to listen. Say “Mayday! Mayday!” and give your situation, destination, and plane call numbers, which should be printed on the top of the instrument panel. 4. If you get no response, try again on the emergency channel—tune the radio to 121.5. All radios are different, but tuning is standard. The person on the other end should be able to talk you through the proper landing procedures. Follow the instructions carefully. If you cannot reach someone to talk you through the landing process, you will have to do it alone. 5. Get your bearings and identify the instruments. Look around you. Is the plane level? Unless you have just taken off or are about to land, it should be flying relatively straight. * Yoke. This is the steering wheel and should be in front of you. It turns the plane and controls its pitch. Pull back on the column to bring the nose up, push forward to point it down. Turn left to turn the plane left, turn right to turn it right. The yoke is very sensitive—move it only an inch or two in either direction to turn the plane in flight. While cruising, the nose of the plane should be about three inches below the horizon. * Altimeter. This is the most important instrument, at least initially. It is a red dial in the middle of the instrument panel that indicates altitude: the small hand indicates feet above sea level in thousand-foot increments, the large hand in hundreds. * Heading. This is a compass, and will be the only instrument with a small image of a plane in the center. The nose will point in the direction the plane is headed. * Throttle. This controls airspeed (power) and also the nose attitude, or its relation to the horizon. It is a lever between the seats and is always black. Pull it toward you to slow the plane and cause it to descend, push it away to speed up the plane and cause it to ascend. The engine will get more or less quiet depending on the direction the throttle is moved. * Fuel. The fuel gauges will be on the lower portion of the instrument panel. If the pilot has followed FAA regulations, the plane should have enough fuel for the amount of flying time to your intended destination plus at least an additional half hour in reserve. Some planes have a reserve fuel tank in addition to the primary one, but do not worry about changing tanks. * Flaps. Due to their complexity, wing flaps can make the plane harder to control. Use the throttle to control airspeed, not the flaps. 6. Begin the descent. Pull back on the throttle to slow down. Reduce power by about one-quarter of cruising speed. As the plane slows, the nose will drop. For descent, the nose should be about four inches below the horizon. 7. Deploy the landing gear. Determine if the plane has fixed or retractable landing gear. Fixed gear is always down so you need do nothing. If it is retractable, there will be another lever between the seats near the throttle, with a handle that is shaped like a tire. For a water landing, leave the landing gear up (retracted). 8. Look for a suitable landing site. If you cannot find an airport, find a flat field on which to land. A mile-long field is ideal, but finding a field of this length will be difficult unless you are in the Midwest. The plane can land on a much shorter strip of earth, so do not bother to look for the “perfect” landing site—there is no such thing. Bumpy terrain will also do if your options are limited. 9. Line up the landing strip so that when the altimeter reads 1000 feet the field is off the right-wing tip. In an ideal situation, you should take a single pass over the field to look for obstructions; with plenty of fuel, you may want to do so. Fly over the field, make a big rectangle, and approach a second time. 10. When approaching the landing strip, reduce power by pulling back on the throttle. Do not let the nose drop more than six inches below the horizon. 11. The plane should be 100 feet off the ground when you are just above the landing strip, and the rear wheels should touch first. The plane will stall at 55 to 65 miles per hour, and you want the plane to be at just about stall speed when the wheels touch the ground. 12. Pull all the way back on the throttle, and make sure the nose of the plane does not dip too steeply. Gently pull back on the yoke as the plane slowly touches the ground. 13. Using the pedals on the floor, steer and brake the plane as needed. The yoke has very little effect on the ground. The upper pedals are the brakes, and the lower pedals control the direction of the nose wheel. Concentrate first on the lower pedals. Press the right pedal to move the plane right, press the left pedal to move it left. Upon landing, be aware of your speed. A modest reduction in speed will increase your chances of survival exponentially. By reducing your groundspeed from 120 to 70 miles per hour, you increase you chance of survival threefold. * A well-executed emergency landing in bad terrain can be less hazardous than an uncontrolled landing on an established field. * If the plane is headed toward trees, steer it between them so the wings absorb the impact if you hit. * When the plane comes to a stop, get out as soon as possible and get away—and take the pilot with you. If you have no time to prepare for the crash and you forget some of these instructions, you can find much of the most important information in the safety card in the seat back pocket in front of you. Learn how to survive a fall from heights. It’s very rare for an aircraft to break apart in midair, but it does happen. If that’s the case, your only chance of survival may be successfully free falling, since commercial airliners don’t have parachutes. Remain in the brace position until the plane comes to a complete stop, a secondary impact or bounce will often follow the initial impact. In the event of a water landing, remove your shoes and excess clothes before or immediately after entering the water. This will make swimming and floating easier. While it’s essential to stay calm after a crash, you also need to be careful not to cope with “negative panic.” Negative panic is a strange inability to react assertively and appropriately to the situation. For example, a person may just remain in his or her seat instead of heading toward the exit. Watch out for this in your fellow passengers or traveling companions. The one exception to the “leave everything behind” rule may be a jacket or blanket, and you should only consider carrying that if you have it ready to go at impact. While having appropriate clothing may save your life if you’re stranded for a while, you first have to get out of the aircraft safely. If you can find a pillow or something similarly soft to protect your head during impact, use it. It’s quite common for people to forget how to unbuckle their seatbelts after a crash. It seems easy enough, but in your dazed condition the first instinct is often to try to push a button as you would for a car seatbelt. When that doesn’t work, it’s easy to panic. 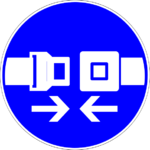 Before impact, make a mental note to remember how to quickly and easily unbuckle your seatbelt. Place your carry-on baggage beneath the seat in front of you. It can help prevent your legs from snapping under the seat. Remove sharp objects—pens, pencils, etc.—from your pockets before a crash. Better yet, don’t carry them at all. Nearly any loose object on a plane can become a deadly projectile in the event of a crash. If you have nothing to moisten a cloth with (in order to protect yourself from smoke inhalation), you can use urine. This sort of breach of decorum is perfectly acceptable in such a situation. When considering what to wear, opt for natural fabrics with a tight weave (i.e. denim). Discreetly notify a flight attendant before take-off if you see person or persons behaving in a suspicious or irrational manner. Read all emergency measures information. Don't just toss it aside. It really is useful. Avoid wearing synthetic fabrics while traveling by plane. If a fire breaks out in the cabin, these materials will melt to your skin. Avoid excessive alcohol consumption before or during a flight. Alcohol impairs your ability to quickly and methodically react to the crash and evacuate the plane. Never hold your infant or toddler on your lap. While it may be cheaper than buying a seat, your child is almost guaranteed not to survive if you are holding him or her. Get a seat for your child and use an approved child restraint system. Don’t get down on the floor of the plane. If there is smoke in the cabin, try to stay low, but do not crawl. You will likely be trampled or injured by other passengers attempting to escape in the low-visibility conditions. Don’t push other passengers. An orderly exit increases everybody’s chance of survival, and if you panic and start shoving, you may be faced with retaliation. Brace positions listed on your airline safety card are designed oddly, and don't make sense to anyone who really looks at them. Doctors have said the positions you sit at listed on those cards will almost definetly break your neck or back. Many firmly believe you should sit straight up and push your hands against the chair in front of you to keep yourself sturdy, and keep the harmful impact to a minimum. Air accident investigators frequently comment on casualties having both legs broken below the knee. (eg after the UK Kegworth crash). Having both legs broken does not improve one's exit capabilities and appears to be caused by the 'brace' position encouraging passengers to tuck their legs under their seat. At impact the legs fly forward and are broken by the seat back of the seat in front. Put your legs straight out in front of you. HOW TO EVACUATE 873 PEOPLE IN 77 SEC. ?! In the wake of nearly 200 passenger deaths in a Brazilian airliner accident, we take an exclusive look at 36 years’ worth of NTSB reports and seating charts. The best way to live through a disaster in the sky? Move to the back of the Airbus. "One seat is as safe as the other." "It's an age-old question. There's just no way to say." "There is no safest seat." REALITY: It's Safer In the Back. The funny thing about all those expert opinions: They're not really based on hard data about actual airline accidents. A look at real-world crash stats, however, suggests that the farther back you sit, the better your odds of survival. Passengers near the tail of a plane are about 40 percent more likely to survive a crash than those in the first few rows up front. That's the conclusion of an exclusive Popular Mechanics study that examined every commercial jet crash in the United States, since 1971, that had both fatalities and survivors. The raw data from these 20 accidents has been languishing for decades in National Transportation Safety Board files, waiting to be analyzed by anyone curious enough to look and willing to do the statistical drudgework. And drudgework it was. For several weeks, we pored over reports filed by NTSB crash investigators, and studied seating charts that showed where each passenger sat and whether they lived or died. We then calculated the average fore-and-aft seating position of both survivors and fatalities for each crash. We also compared survival rates in four sections of the aircraft. Both analytical approaches clearly pointed to the same conclusion: It's safer in the back. In 11 of the 20 crashes, rear passengers clearly fared better. Only five accidents favored those sitting forward. Three were tossups, with no particular pattern of survival. In one case, seat positions could not be determined. In seven of the 11 crashes favoring back-seaters, their advantage was striking. For example, in both the 1982 Air Florida accident in Washington, D.C., and the 1972 crash of an Eastern 727 at New York's Kennedy Airport, the handful of survivors were all sitting in the last few rows. And when a United DC-8 ran out of fuel near Portland, Ore., in 1978, all seven passengers who died were sitting in the first four rows. Oddly, the five accidents that favored front-cabin passengers all occurred between 1988 and 1992. In the 1989 United DC-10 accident in Sioux City, Iowa, for example, the majority of the 175 survivors sat ahead of the wing. There was just one crash in which passengers in the front had a pronounced survival advantage. The only two fatalities in a 1989 USAir runway accident at LaGuardia were both sitting in Row 21 in the 25-row Boeing 737-400. Where detailed seating charts were available, we also calculated survival rates for various parts of the passenger cabin. Again, the trend was clear: The rear cabin (seats located behind the trailing edge of the wing) had the highest average survival rate at 69 percent. The overwing section had a 56 percent survival rate, as did the coach section ahead of the wing. First/business-class sections (or in all-coach planes, the front 15 percent) had an average survival rate of just 49 percent. So when the "experts" tell you it doesn't matter where you sit, have a chuckle and head for the back of the plane. And once your seatbelt is firmly fastened, relax: There's been only one fatal jet crash in the U.S. in the last five-plus years. Wear long pants, a long-sleeve t-shirt, and sturdy, comfortable, lace-up shoes. Of course you may want to be comfortable or professional-looking on a flight, but sandals or high heels make it hard to move quickly within the wreckage. Loose or elaborate clothing also poses a risk, as it can get snagged on obstacles in the close confines of a plane. If you know you’re going to be flying over cold areas, dress appropriately, and consider keeping a jacket on your lap. You’ll need to be able to stay warm if you survive the crash. Even if that is not a consideration, the more of your body is covered during impact, the less likely you are to receive serious injuries or burns. Cotton or wool clothing is also preferable as it is less flammable. Wool is preferable to cotton when flying over water, as wool does not lose its insulative properties to the degree cotton does when wet. You can put somebody else's oxygen mask on even if they're unconscious.